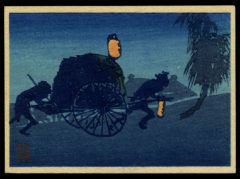 Osaka ukiyo-e print artist, pupil of Kunimasu; possibly the same artist as Sadahiro; other names include Utagawa, Gosotei. Taken in whole, or in part from: Lane, Richard. Images from the Floating World: The Japanese Print. Konecky and Konecky: New York. 1978.